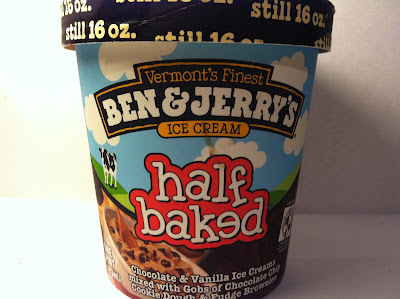 I don't want to look too hard because I'm mostly lazy, but Ben & Jerry's Half Baked ice cream seems like it has been around forever and is one of their standard flavors, unlike a lot of the Ben & Jerry's flavor reviews that I've done here. Heck, it's been around long enough that they have even transitioned it from a full blown ice cream to a healthier frozen yogurt flavor (review coming later...maybe). Anyway, Ben & Jerry's full flavor description of this one is a combination of two different ice cream flavors and the actual container states "Chocolate & Vanilla Ice Creams mixed with Gobs of Chocolate Chip Cookie Dough & Fudge Brownies." Fudge brownies and cookie dough?! Wow, a fat kid's delight and one that I had to get my hands on for a review! I picked it up at Meijer on sale for $3.00 for the pint and each pint contains four servings at 270 calories per serving. As you might expect from an ice cream that is the combination of two different separate flavors, this one is a mess to look at because there is so much going into this pint. You can obviously see the two flavors in the picture above and if you look closely enough (or take my word for it), you'll see that there are several good sized chunks of both cookie dough and fudge brownies spread throughout the pint. Each cookie dough and brownie piece maintains a degree of softness, which considering this is a frozen treat, is definitely something that is pretty awesome. 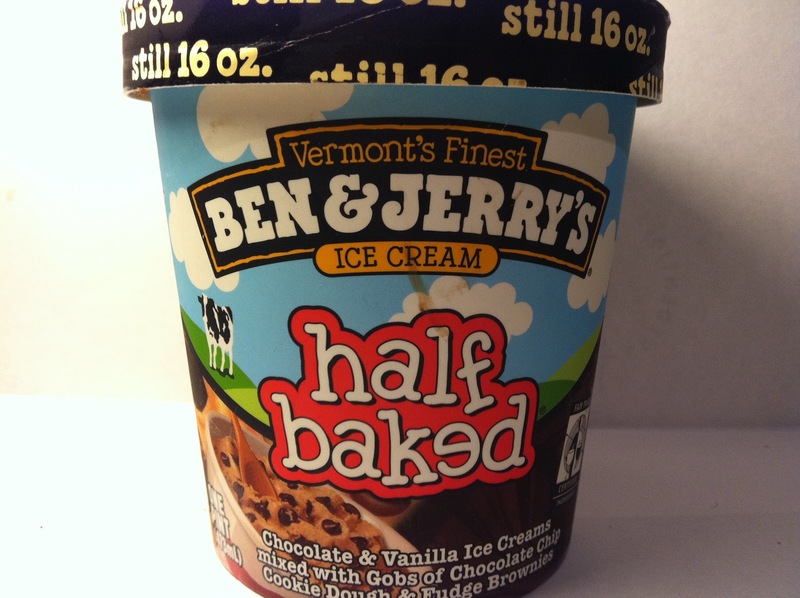 Ben & Jerry's does this with a lot of their flavors and they should be commended for it. In terms of taste, I can't say there is anything really surprising about the taste of this, but that is not a bad thing. The chocolate tastes like chocolate, the vanilla tastes like vanilla, the cookie dough pieces taste like soft, chewy cookie dough and the fudge brownie pieces tastes like chewy fudge brownies. All in all, there are no surprises and that is a good thing in this instance. 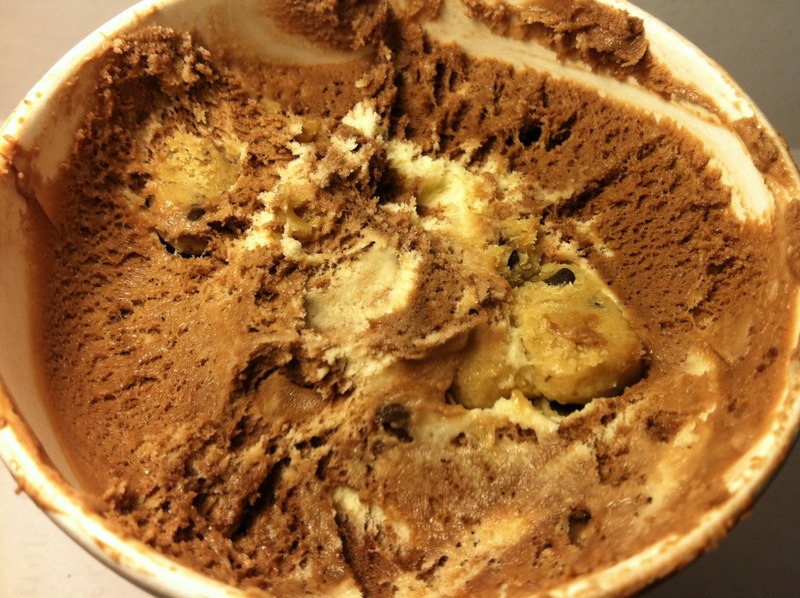 In fact, even though this is a near kitchen sink of an ice cream pint (Ben & Jerry's does have an "Everything but the..." kitchen sink ice cream that does have seemingly everything in it, but the way), everything in here works well in a cool, refreshing and chewy way. The only thing is that you can almost feel the button on your pants waistline popping as you dig in for spoonful after spoonful, because it's not exactly the most calorie friendly treat. Of course, most Ben & Jerry's ice creams aren't, so you know that going in. Buy It or Fly By It? BUY IT. Like I said, this is nothing surprising and that is a good thing. If you want a nice and comforting ice cream treat and don't feel like venturing out to try something entirely different or off the wall, this is a good and safe choice for you to pick. I know that despite the lack of originality in picking this one on my part, I was certainly glad that I did so.